Have you noticed a strange red mark on the top of your foot? Do you think you’re seeing floaters on your eyeball more often? Do you feel lower back pain only hours after getting up in the morning, and you haven’t done anything physical? Does one of your back molars hurt when you chew on that side? Your knee joints ache? Your neck hurts? Numbness in your shoulder? Congratulations! You’re aging. The thing is, mentally I’ve begun to think that everything is something. And worse, that the something is going to kill me. Experts like to say that one of the challenges of growing older is knowing which pains we need to pay attention to and which ones we can ignore. I’m going with the contrarian tack. I’m thinking that any one of these pains is going to kill me and as a result I feel more sanguine about the whole aging mess. 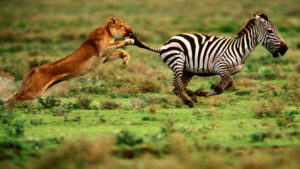 It feels a little bit the zebra trying to outrun the lion and after exhausting itself it just gives up and goes down. Well, maybe that’s not the best metaphor. I don’t expect to be torn apart by a predator cat, but I know I’m going down some day and it’s totally impossible to predict which pain or bizarre symptom is going to mark the beginning of the end. I’m not going to blithely ignore serious ailments. Even zebras would go to the doctor for routine ailments if there was a veterinarian around out on the savanna. It would be foolhardy to ignore some of the more obvious signs of cancers or dementia and I’m certainly not advocating willful ignorance. The reality for all of us is that something that starts out small is going to be the thing and there’s not much we can do to alter that. We can be watchful, exercise, eat as well as we can and live life to the fullest. And isn’t getting the most joy out of life while you can the best revenge? I know…tell that to the zebra.